What Is my Moral Compass? How do I read the Moral Compass? That, in short, is your moral compass. You’re thinking, “Wow, just a compass.” The answer to your thoughts – yes, a compass. But not just any compass – a compass that tracks all the changes that happen in your alignment including the changes of Good to Evil and Chaos to Unity. How do you find your moral compass? This is the easy part. Simply talk to Twilly in the town of BattleOn! and hit “Show me my Moral Compass!”. Once you do, an image like the above will appear. All you have to do is click on the massive green dot, and your compass opens! 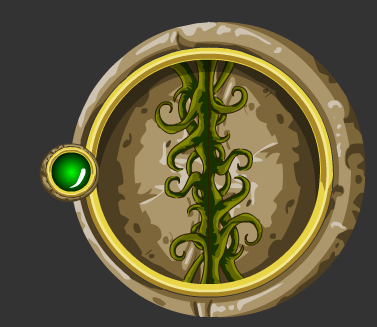 Upon starting your adventure in AdventureQuest, your Moral Compass will be completely balanced. As you go through your adventure, you will make choices in the Devourer Saga that influence the rewards/cutscenes you get from the Saga itself. 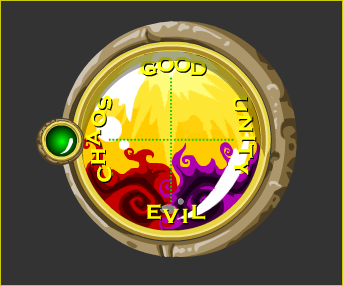 If you are perfectly balanced, you have a chance to get both the Chaos/Evil awards and the Unity/Good awards. Not only do the effect which cutscenes you view, it also effects the rewards you get from them. Have you gone awry with your alignment, or do not know how it is changing? Never fear! You can always change your alignment….read on to find out how. How do I read my Moral Compass? This your moral compass open. You notice straightaway that there is a shimmering dot that seems to wander around as you go through the plotline of the Devourer Saga. What is going on? Your alignment is shifting. The shimmer represents your alignment, and the compass is basically all the alignments that come to pass. Can’t read it? Well allow me to help you. Undoubtedly you’ve already realized what a pain in the neck reading this compass is. Well, you’re almost right. A pain it is, but unreadable it is not. First let’s look at the compass. Assuming it’s a real compass, we see Good at “North”, Evil at “South” Unity at “East” and Chaos at the “West”. Well, they all either effect your storyline, the items you can get, and the power of the items themselves. So, now let’s get to the reading bit. I’m going to ask you momentarily to go back to elementary school math, where you were learning coordinate plains. 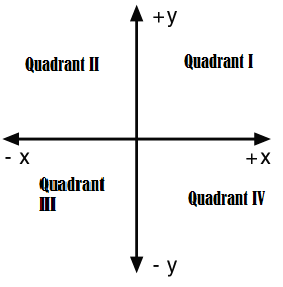 You undoubtedly heard the teacher explaining to you what the quadrants were named (I, II, III, and IV) and why they are named this way. Look at this coordinate plain below. Looks a lot like your moral compass, right? (Agree with me for now, this’ll all make sense). Well, as you may have already figured out, the Moral Compass is a coordinate plane. The shining point represents a point in a coordinate plain (an axiom of algebra, in case your a math nerd). You can become as much as +/- 6 in each category. So, technically, being at the top right corner of Quadrant I or the bottom right corner of Quadrant IV are the best. How do you align yourself? By doing the quests below. Each time you make a choice, the Evil/Good/Chaos/Unity alignment shifts “1” towards/away from the +/- 6 that you can reach. Now you know how to read your compass – here comes how to influence it/what it influences! Special Note from Character Alignment (Thanks to ArchMagus Orodalf) – Alignments can go to ±17, but currently they have a maximum of +6 and a minimum of -6. However, The Beginning of The End can get your Chaos/Unity Alignment to ±7 if you are currently at ±6. War of the Clans! – In this war, you can choose to be Unity or Chaos. It is quite a quick way to become either – and they both influence the prize from that war….the Chaos Unity Shield. 2 Choices: Affects Chaos/Unity and Good/Evil. The prizes themselves are effected by your alignment as well. I suggest not having both Good/Evil rewards…but that is another story. Strange Friends: You are initially presented with a choice between Good/Unity and Evil/Chaos, but the Evil/Chaos one has a sub-choice between Unity and Chaos while the Good/Unity one simply continues the quest. Attack on Granemor: This quest is excellent. You have a simple alignment choice at the beginning….but this gives you +/- 1 to Chaos and Evil or Unity and Good. This influences both axes – very nice, all in all. The rewards include the Fleshrenders, but they are not influenced in any way. The Fall of Augerthorne: Again, nothing special. A simple alignment choice. This is Chaos/Unity. The Manifestation: You face an alignment choice. Nothing difficult – just the same old same old Chaos/Unity stuff. After you beat the war/boss battle, a cutscene appears. It is based off your Chaos/Unity alignment. The Disorder Flux Series use Chaos alignment to deal more damage….be careful if you are Unity/Good. The Kindheart Mirror Series favors good. The Elemental Unityspells favor Unity as well…the Mark of Hope favors both…but the weapons it summons can go either way. The The Evil Eyeglasses favor Evil….that’s all! Frostval in July – One choice, Evil or Good. Upon Choosing Evil, you steal some Nightmare coins. Another alignment choice here. Pick Good or Evil – they influence the cutscenes in this one. I’m not much good at these….but all I will say is that the choice is yours – and each choice is formidable. Myself, I hop back and forth depending on what weapons/spells there are. I’d recommend, however contrary to what I do, is to choose one and stick with it to get the most power out of the equipment you do get. The Devourer Saga always ends the same way – The ‘Galin thinks you are a treacherous dog and decides to come kill you and all your friends! How cheery, eh? Anyway, that’s besides the point….both sides are awesome ones…pick whichever one you like best and journey on, into the world of Lore!